Japanese: Where are my animations? The bad news is that this system function overrides the kanji animation’s trigger (double tap) in my app. Until I think of a workaround for this, double tap just below or above the question to see the animations as before and double tap on the question to see the definition. Version 2.3 has around 250 audio files for all the example words plus a few corrections to the data files. Now that Flash! is finished and currently waiting for approval, I can spend a bit of quality time with some updates. I hope to update all apps this month with minor fixes and a few data corrections. 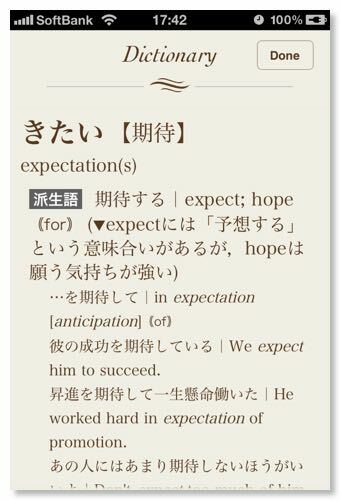 Either this month or next, I’ll be adding a brand new example sentence database to the Japanese app. Far bigger and better than the current version. Dictionary support is also on the to do list. 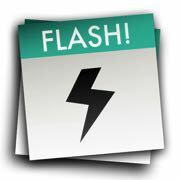 As well as “Flashcard Exchange” adding “Quizlet” to the Flash! app is in the pipeline. SS + WWW = Flash! As of next week, what you have in your flashcard app will be entirely up to you. Flash! is the slickest way to choose from millions of decks from around the world and increasing your knowledge. No annoying registration or usernames required - just download and go. Simply cut’n’paste your data into the app (settings). Available in a few days. What do all these settings in my app mean? Hopefully this new page will answer some of your questions. An update to fix the examples sentences bug will be available within the week. Apologies. This only affects those who are updating the app and not new purchases. A feature conspicuous by it’s absence, it’s now time to allow you guys and gals to import your own data. Up until now I have been reluctant to spend too much time adding import functionality as I’ve always believed that if the original data was good enough to start with, it wouldn’t be required. 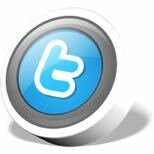 But, I’m bored and I want to add some new features for you all. I’ll be offering an “import text box” within the app. 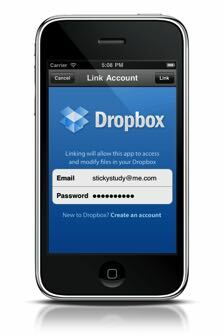 Just copy and paste your data into this box (maybe from an email or notepad) and the app will automatically format the data ready for study. I’ve looked at iTunes synching functionality but I tend to use my phone away from my computer a lot so I’m more interested in making the iPhone (or whatever) a self contained study device without the need for connecting a cable. If you have any thoughts or opinions, I’d be very interested to know. I’m aiming for an October update for Kanji and Chinese. This is for you traditional guys/gals out there. The next update will include the new TOCFL (previously TOP) vocabulary files (basic, beginner, intermediate and advanced) and an updated examples sentence database with both simplified and traditional characters. Rearranging the official lists is taking some time (due to multiple entries for the same head-word) but I’m aiming for an early September release. Now available in an App Store near you. The complete solution for those working towards the HSK test. All the vocabulary and hanzi for all 6 levels given the StickyStudy treatment. ✭ Many internal improvements and an oil change. The app is now called “StickyStudy: Japanese” to stop confusion. For me. Available in a week or so. New FAQ page (top left menu option). Oops. The two stickies “休” and “父” in Kanji N5 have their definitions swapped. Apologies for missing this one. 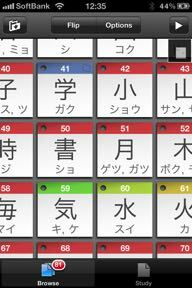 A fix for “Kanji Lite” has just been sent to Apple, “Kanji” to follow soon. If you’d be interested in trying to break and generally cause havoc with my new Chinese HSK app for the sake of bug finding, please get in touch. The next update of Kanji (v1.9) contains completely rewritten JLPT N1-5 files. They include more readings and, well, they’re just better. N3 vocabulary and kanji files are now separate. The “Joyo Kanji (New)” file has also been updated. Early in the app’s development I decided to only include kanji readings that were commonly used while omitting some of the exotic, less used readings for the sake of efficiency and sanity. But, instead of enforcing this methology on my dear users I decided just to start from zero and make files that contain as many readings as possible. To protect your data, files will NOT be updated or overridden upon updating the app unless you restore the original file using the “Restore Original File” setting in study view or if the app is reinstalled. To access the new N3 files without reinstalling the app, create an empty file called “JLPT Kanji N3” or “JLPT Vocab N3” and restore this file with the “Restore Original File” setting. The file will be filled with the N3 data. If you have any problems or questions, drop me an email. For those of you taking the HSK test, the ultimate study partner is on its way. Buckle your seat belts. Available in a few days. 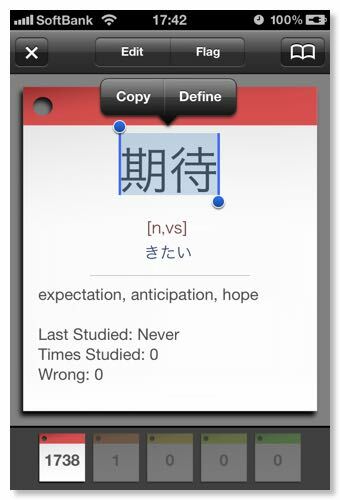 Kanji Lite (JLPT N5) is a lite version of the kanji app that allows you to try before you buy. The basic functionality remains the same without the kanji animations, example sentences, file functions, progress view and a few options. Ready and loaded with the two essential JLPT 5 files: vocabulary and kanji. Available in a few days. Just a minor oil change this time around with a few bug fixes and the addition of 3 new files KanKen 4, KanKen 3 and KanKen 2.5 which roughly equate to School Grade 7, School Grade 8 and School Grade 9 respectively. KanKen (or 漢字検定 / 日本漢字能力検定試験) is the official Japanese kanji test for Japanese people. Humans can only dream of attaining level 1. The Heisig file has now been removed from the app at the author’s request. Current users of the file will remain unaffected. I don’t know.. every time I release an update I think, “Right, that’s it. I’m going to have myself a little break for a while” but I just can’t help myself.. When a file is more than 20% learnt (still playing with this number), previously mastered stickies will reappear every now and again. I was weary of not making their presence too overpowering hence my initial reluctance in implementing this popular request. Having a blank sticky may sound strange but there is method in my madness. Large files take a while to load in tile view because of the text but the background colours load almost instantly. Having this blank option allows you to see at a glance how you’re doing without worrying about loading times . When zoomed out (as in above screenshot) single screen taps are ignored so you don’t tap a sticky by mistake. Pinch and double tap remain unchanged. Editing has been enabled with the exception of the Heisig number field. [Fixed] Corrections in "new joyo kanji"
Any other ideas? Drop me an email. ✔ iPhone 4 behaviour has been improved a lot (because I now have one to play with). I made the naive assumption that seeing as the iPhone 4 has twice the memory that I could use nearly twice as much. We learn, we grow. The memory usage has now been adjusted more sensibly. ✔ Study options sometimes forgot their settings. Fixed. ✔ The date picker now works when using Japanese localisation. Note: The grade files will only be updated on your device when you select “restore original file” in the study settings. Otherwise, the update would quite happily write all over your files and scores which probably wouldn’t make me too popular. Currently, selecting this option will “drastically exit” the app (this will be fixed..) but it still works as advertised without any problems. The tank is full and the tires have been kicked. Available now. 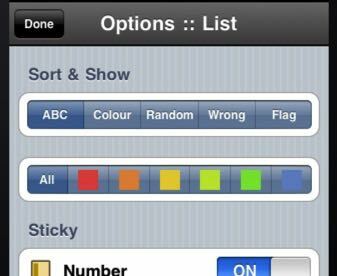 [Changed] Navigation box more accurate and larger on iPad. Smaller in landscape view on iPhone. Many other small changes and some bug fixes. Keep the feedback coming! Stickystudy: kana has just turned 2! Now complete with audio and brush stroke animations for all characters. A very, very effective way to learn kana fast. Available now. 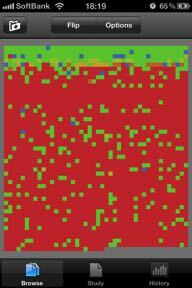 I didn’t really plan on releasing an update THIS quickly but the new “flag” feature in the app just wasn’t behaving itself.